Back to the EXIF Editor and Viewer website. 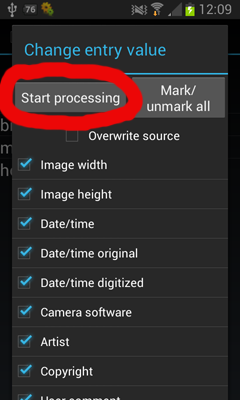 Photos captured with Android devices often containg EXIF tags which include useful information such as exposure time, ISO value, and other camera parameters. 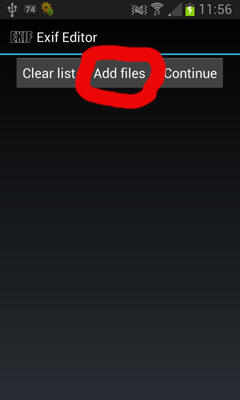 But there are also tags which can harm privacy, such as GPS position data. This tutorial shows how to remove EXIF tags from images. 1.) 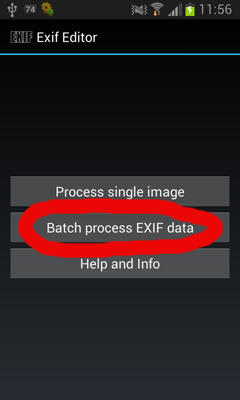 Start Exif Editor and select "Batch process EXIF data". 3.) Select image from which you want to remove EXIF tags. 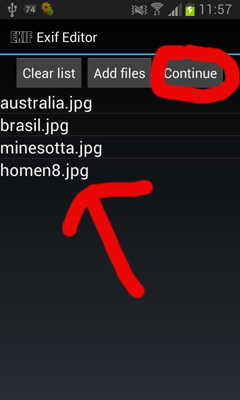 If you want to select a single image chose "Image from gallery". If you want to select multiple images at once chose "Multiple images". 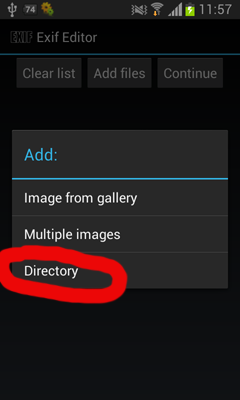 If you want to process a whole folder with images chose "Directory". 4.) Now you see a list of files which will be processed. Press "Continue". 5.) 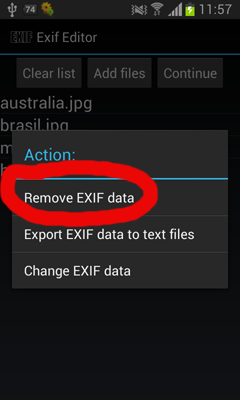 Select "Remove EXIF data". 6.) Select the tags you want to remove (by default all tags are removed which is recommended) and press "Start processing". A progress dialog will appear and after a few seconds all tags are removed from the selected images. If you selected "Overwrite source" (not recommended!) then the EXIF tags from the original images are removed. Else the images without EXIF tags are store in the "DCIM/ExifEditor" folder.